The noble Ultramarines epitomise the Space Marines, the genetically enhanced warriors who protect the Imperium from its foes. Newly returned from the Eye of Terror, Captain Uriel Ventris must redeem himself in the eyes of his battle-brothers, who fear he may have been tainted by Chaos. When the planet Pavonis is invaded by tau, what better opportunity could Uriel have to join his Chapter in combat and prove that his honour is beyond reproach? This was a fun book to write, as it was a chance to get back to basics with the Ultramarines. I’d taken them off to the Eye of Terror in Dead Sky, Black Sun and left them there for a while, as I went off and did other projects, but they were always itching to get back to Ultramar. I knew right away that I couldn’t just have them turn up at the gates of their Chapter Monastery and say, ‘Hi, we’re home…’ so that entailed The Killing Ground, a novel about the steps on the way home. Like DS, BS, it was a novel that took the Space Marines out of their comfort zone and had them doing very un-Space Marine-like things, so with Courage and Honour, it was time to rectify that. I wanted this to be the book that reminds the reader why Space Marines are the premier fighting force in the galaxy. The Imperial Guard may number in the millions, but it’s the Space Marines that do the really hard work, the missions that absolutely cannot be allowed to fail. This was going to be a war novel, a book that had the Space Marines doing what they did best, killing their foes with complete and utter dedication and professionalism. I wanted Courage and Honour to be a simple story, and when I say that I don’t mean without complexity, I mean that it showed the Ultramarines – and Uriel – in the most classic Space Marine light possible. 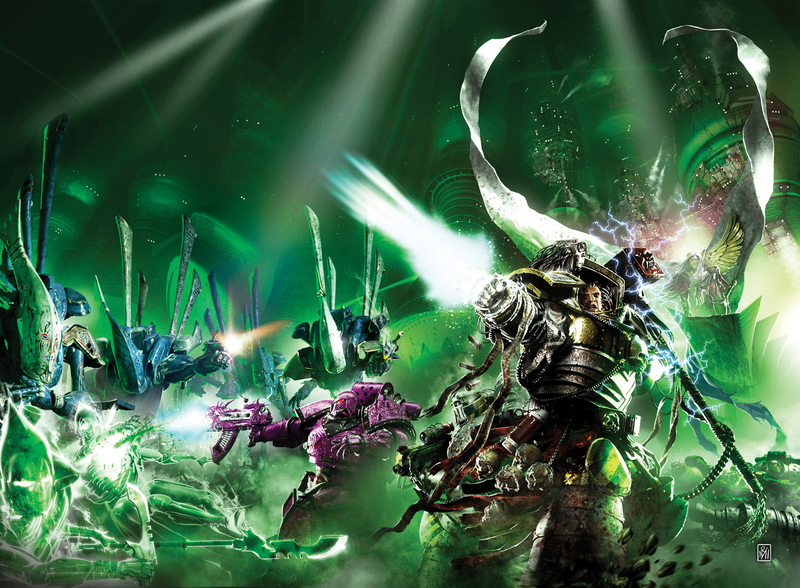 These weren’t Space Marines operating outside the Codex Astartes, these were warriors who fought with their Primarch’s holy tome as their guide, and were winning with it at their side. Of course, I wanted elements that weren’t exactly codex, which is what led to Learchus going behind enemy lines and learning what had driven Uriel to make the choices he made. It’s a book with plenty of action, from all levels of the conflict, and I hope shows the brutality of warfare in the 40K universe, while also highlighting the heroism and horror that can come out of such desperate conflicts.